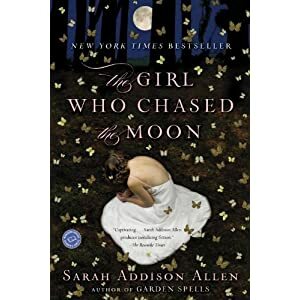 The Girl Who Chased The Moon by Sarah Addison Allen – Books, Books and More Books! Allen’s book “Garden Spells” is one of my all time favorites. A book I’ve loaned many times. When I found “The Girl Who Chased the Moon”, I was thrilled! Allen takes us down South, where in my opinion, the best magical things happen. When Emily shows up in Mullaby, NC to meet a grandfather she doesn’t know and never knew she even had, she finds out quickly that Mullaby and its residents aren’t exactly what they appear to be. But her grandfather seems to be the only family she has so she sets out to find answers. Why did her mother never tell her about her family? Why did she never return to Mullaby? Unexplained things begin happening, the wallpaper changes on its own and mysterious balls of light streak through the trees at night. Emily finds a friend in 30 something Julia, next door, who has also returned to Mullaby to sell her father’s BBQ joint. Julia is a baker of cakes, and has secrets of her own. Magic, mystery, cake and the South…This is an absolutely delicious book!